Melinda Price has had many jobs: tech worker, caterer, waitress. But it took her a while to reach the goal she set in 1990, when she was working as a high-fashion model in Paris and resolved to one day be a farmer. 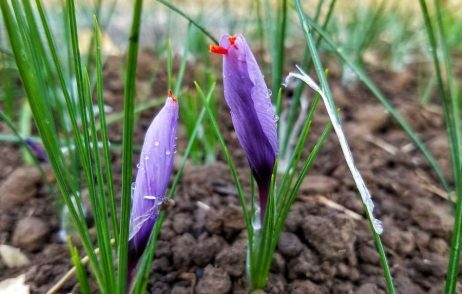 In January, Price and her husband Simon Avery began selling their first big harvest of the organic saffron they first planted in 2017 at their Peace and Plenty Farm in Kelseyville (Lake County). A Mediterranean specialty, saffron is one of the world’s most expensive spices because each brick-red thread must be picked from a single purple flower. The couple harvested 58,000 flowers by hand, carefully removed the threads and then dried and cured them. Price and Avery believe they are the first to farm a culinary version of the spice in California — there’s a Half Moon Bay grower who grows saffron for medicinal use — and one of the few in the United States. They join the ranks of other California farmers who have recently attempted to grow novelty crops that haven’t previously thrived here, including coffee and tea, which do best in the tropics, and European specialty items like black truffles and escargot caviar. To continue reading the article by Tara Duggan, click here to visit SFChronicle.com.